Planning a trip to Malaysia ? A bewitching mix of the ancient and the ultramodern, Malaysia is every traveler’s dream. With skyscrapers and minarets, Roti Canai selling street stalls and Michelin starred restaurants, rainforests and white sand beaches; it is a country of contrasts with something for everyone. A melting pot in the true sense of the word, Malaysia is home to a myriad of cultures and ethnicities. Malays, Indians and Chinese, all inhabit this beautiful Southeast Asian nation reveling in their cultures, faiths and ways of life exemplifying its tourism slogan “Malaysia. Truly Asia.” This Malaysia travel guide showcases the very best of the country. While the country experiences warm beach days all year, the best time to visit Malaysia is during the dry season between March and October. The country comes alive during the Harvest Festival in May, Diwali in November and the Chinese New Year; all great times to get acquainted with Malaysian culture and traditions. Malaysia experiences typically equatorial climate with hot, humid weather throughout the year and occasional showers. Malaysia is best enjoyed between March and October. The months between November and February represent the wet season on the Malay Peninsula with thunderstorms playing spoilsport. 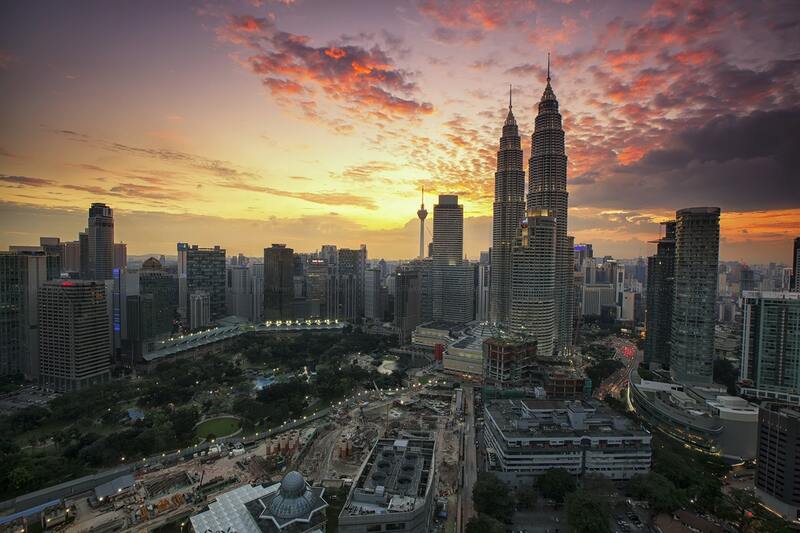 Every Malaysia travel guide begins with at the capital city of Malaysia, the glittering Kuala Lumpur. A mesmerizing potpourri of the old and the new, KL is known for its sky piercing high-rises, colonial relics and its unforgettable street food. Don’t forget to add the iconic Petronas Towers, KL Tower and its spectacular views, the temples at Batu Caves and the charming streets of China Town with delicious street fare and open-air markets to your Malaysia travel planning. Known for its cerulean waters and emerald hills, Langkawi is one of the most popular destinations in Malaysia finding its way in every Malaysia travel guide. The archipelago of nearly a hundred islands is known for its white sand beaches, dense jungle and paddy fields as far as the eyes can see making for some of the most beautiful landscapes you will ever see. Be sure to walk the length of the stunning Langkawi Sky bridge, stroll by Eagle Square that is synonymous with the islands and the highest peak in Langkawi, Gunung Raya. The islands are also magnets for tourists seeking sun, sand and great food in one of the most beautiful locales on the planet. The “Pearl of the Orient”, Penang is known for its incredible cuisine, colonial architecture and virginal natural scenery. Located in the northwest of Malaysia, Penang Island is home to fascinating works of architecture including the center of the capital city George Town that is a UNESCO World Heritage Site. The center showcases the rich history of Penang with Fort Cornwallis, City Hall and the Penang State Museum as well as the Goddess of Mercy Temple. A favourite of the standard Malaysia travel guide is Tanjung Bungah, an idyllic beach town that is famed for its natural landscape and watersports that make for essential Malaysia travel planning. Oft ignored by Malaysia travel guides, Sarawak is Malaysia at it's wildest. Located on the island of Borneo, Sarawak is home to dense rainforests, serpentine rivers, ancient cave complexes and some of the rarest wildlife you are ever likely to encounter. As part of you Malaysia travel planning we recommend a visit to the Gunung Mulu National Park and the Sarawak Cultural Village. Also called the Langkawi SkyCab, the cable car promises you breath taking views of the hills, cliffs, waterfalls and beaches of Langkawi. Hop on to one of the cars at the Oriental Village and enjoy panoramic views all the way up to Gunung Machinchang. The ride should take about a quarter of an hour with plenty of photo opportunities of the turquoise bay and the lovely hills with glimpses of the Sky Bridge. This one should make the top of your Malaysia travel planning. A Malaysia travel guide favourite, Langkawi is a haven for adrenaline junkies. The islands offer a host of water sports and activities that you must try. Get your hands on a jet ski and ride the waves or ride a banana boat with your family. The beaches on Langkawi also offer parasailing, wakeboarding, scuba diving, sailing and kayaking. With palm fringed beaches and a sunny climate, Langkawi is the perfect destination for water sports in Malaysia. Your Malaysia travel planning would be incomplete without a day at Sunway Lagoon Theme Park. Located 15 km from Kuala Lumpur, Sunway Lagoon is made up of five different zones - the Water park, Scream Park, Amusement Park, Extreme Park and Wildlife Park, promising fun for the whole family. Also enjoy the surf beach, wave pool, a life size pirate ship as well as extreme sports, scare zones and Asia’s highest slingshot ride. It offers a great break from sightseeing and is recommended for families with kids. A UNESCO World Heritage Site, the Gunung Mulu National Park is a sight to behold. Home to gibbons, orangutans, hornbills and rhinoceros, a safari in the Park is a part of every Malaysia travel guide. Don't forget to explore gargantuan Deer Cave, the Garden of Eden and the Pinnacles, a series of jagged limestone formations.